Many organizations run credit checks on job applicants and use that information as part of a background check when making hiring decisions. A Society of Human Resources Management (SHRM) survey indicated that 60 percent of employers check the credit of at least some job applicants. Only 13 percent of the employers in the survey ran credit checks on all applicants. A more common practice was checking the credit history of finalists and using this information to rule out candidates with questionable backgrounds. A job applicant credit report will show details about you and your finances, including your name, address, previous addresses, and social security number. The report will not contain your age or precise credit score. It also shows the debt you have incurred including credit card debt, mortgage, car payment, student loans, and other loans. Your payment history is disclosed, including late payments and defaulted loans. The Fair Credit Reporting Act is a federal law placing restrictions on employers’ rights to check your credit during the hiring process. Before a company can check your credit, they need your permission. What they discover can create problems for job applicants. Especially if you've been unemployed, it can be hard to have a good credit history. If a credit report impacts a hiring decision, the employer is required to inform the applicant. The candidate has the opportunity to contact the credit agency and correct any inaccurate information. Once you learn that the company will be running a credit check, there are ways you can let your prospective employer know that there may be issues with your credit check. It's better to be proactive and at least have a chance to explain, and hopefully be able to continue in the application process. If a company finds out by surprise that you have credit problems, you have probably lost your chance at the job. Familiarize yourself with the information contained in your credit report, especially any negative or incorrect notations. Attempt to correct the negative information in your credit report prior to seeking employment. If an employer informs you that they will conduct a credit check that you know will reveal damaging information, be prepared to decide between withdrawing your application for employment or pursuing the job. Pursuing the job may still be an option, especially if you have taken measures to improve how you manage your finances since the negative notations in your report. Be sure to mention how you are addressing the situation to the employer when discussing the credit check. If you are denied employment based on information on the credit report, speak to the employer to see if you may re-apply after addressing their concerns. The Equal Employment Opportunity Commission (EEOC) oversees employer practices regarding applicant credit checks. If you suspect that credit checks by an employer are having a disparate impact on candidates due to race, ethnicity, age, or gender, then you can report the potentially offending organization to the EEOC. 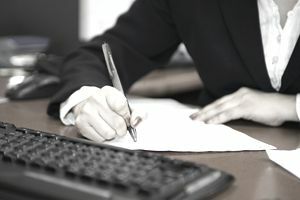 In these states, the use of credit checks is often restricted to specified occupations or situations where financial transactions or confidential information are involved. Many other states have legislation pending that might prohibit the use of credit reports by employers or place restrictions upon their use. In addition, some localities also have restrictions and prohibitions on job applicant credit checks. For example, New York City prohibits credit checks on most job applicants. Exceptions include top-level executive candidates with fiduciary responsibilities and applicants who would manage assets or oversee financial agreements worth over $10,000. Contact your State Department of Labor for information about how current laws apply to your location.